If you’re an office drone in need of a mid-afternoon pick-me-up, you might decide to sip some espresso. Or you might decide to guzzle some soda. Now, thanks to the Suntory company, you don’t need to decide at all. Its new “Espressoda” product appears to combine both experiences in one handy bottle. Caffeine junkie that I am, I was quite excited when I saw this beverage in a vending machine in the building where I work. When the bottle came out of the machine and I was able to read the ingredient list on the back label, I was disappointed to see that sugar was the first ingredient. (Coffee was second.) I’ve been trying to cut needless sugar out of my diet, so I knew I probably wouldn’t be buying this product again. 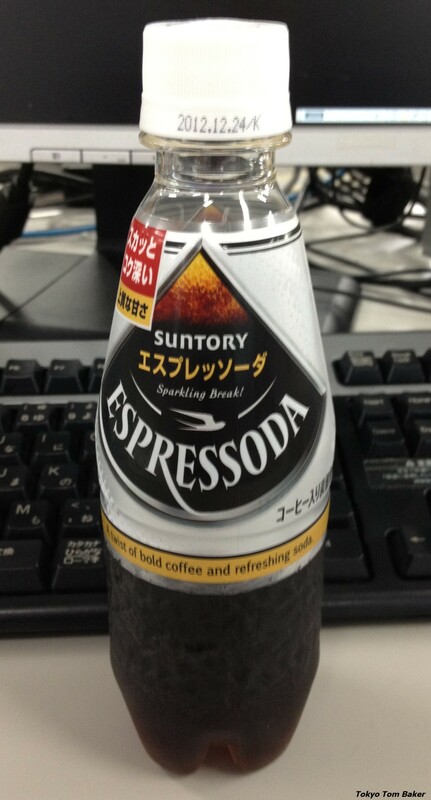 On the other hand, I have enjoyed coffee ice cream and coffee-flavored candies in the past, so I still expected to enjoy drinking Espressoda. Alas, the beverage didn’t strike my palate as sweet at all, but harsh and stale, like coffee that had been left out overnight. I wound up pouring most of it out in the sink. I love coffee, but this was not my cup of tea. 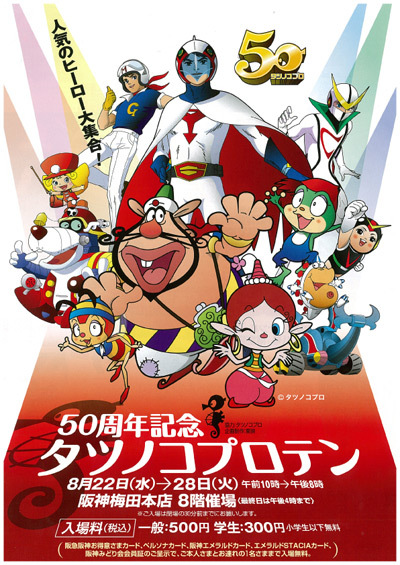 Tatsunoko Productions is a major producer of Japanese anime. 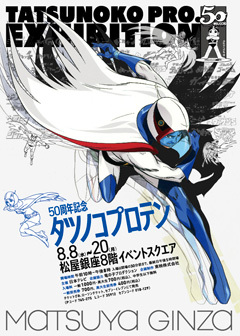 If you ever enjoyed watching “Gatchaman” (“Battle of the Planets”) or “Mach Go Go Go” (“Speed Racer”), you have Tatsunoko to thank. Right now in Tokyo, and coming soon to Osaka, there is an exhibit filled with cels, videos and original drawings from dozens of Tatsunoko TV series. I recently paid a quick visit to the Tokyo show on my lunch break, and realized there was more material there than I could absorb in my limited time. However, I did enjoy playing a short game of “spot the reference,” beginning when I noticed that the company’s earliest character – the hero of a 1965 black-and-white show called “Uchu Ace” (Space ace) – had an asymmetrical crescent crest on his space helmet just like the one Date Masamune (1567-1635) had worn on his battle helmet four centuries earlier. Looking through time in the other direction, a rocket launch facility in “Space Ace” strongly resembled Syndrome’s lair in “The Incredibles” (2004). Despite his costume, Ace didn’t have a buff superhero physique. He looked more like one of the original Campbell’s Soup Kids, probably because he was created by people who grew up in straitened times when chubbiness was something to aspire to. 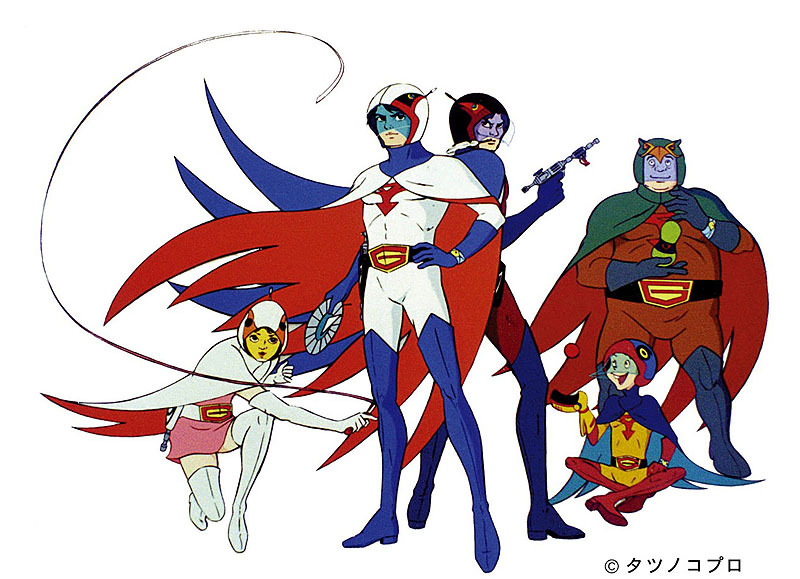 That changed pretty fast, however, with the full-color characters of “Gatchaman” in the early 1970s looking like slim disco denizens – especially when they hung up their superhero capes and got into their civvies, which included thick-soled boots, bell-bottom pants, superwide belts and cataracts of shaggy hair. Admission to the Tokyo show, which runs through Aug. 20 at the Matsuya department store in Ginza, is 1,000 yen. Admission to the Aug. 22-28 Osaka show, at the Hanshin department store in Umeda, is only 500 yen. For details, see the promotional posters at the top and bottom of this post. You are currently browsing the Tokyo Tom Baker: The Blog blog archives for August, 2012.